Deuter Aircontact Lite 60+10 SL Backpack For Women is from a new 2018 series, a lightweight and reliable tool with an excellent adjustable suspension system and numerous attachment elements. Deuter Aircontact Lite 60+10 SL Backpack for women. Adjustable torso length – Vary Quick system. Expandable collar adds 10 liters of volume. 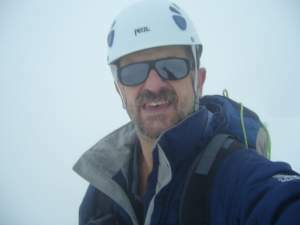 Deuter has several backpacks series with similar names. So you can see their Aircontact series, Aircontact Pro, and also ACT Lite series. But what you have here is a part of a new series launched in 2018, so these packs are with the name Aircontact Lite and you have versions for men like this 65 liters pack, and the packs designed specifically for women in the sizes of 35, 45, and 60 liters. It appears that there is very little difference between these packs and those from the ACT Lite series. The packs for women all have the letters SL in the name, and this means ‘slim line’. This implies several things, like a narrower shoulder harness, different shape of the hip belt fins, different padding on the hip belt and on the shoulder straps, etc. By weight, these new packs are lighter than the packs from the Aircontact series, although lightweight they are definitely not the lightest on the market. The number 10 in the name indicates the fact that you have an expandable collar where you have no less than 10 liters of extra volume when needed. To use this extra space properly, the top lid is movable, you have straps to raise it up to adjust for extra stuff added into the pack. But the lid is also completely removable as well, though you do not have an extra flap to cover the pack in this case, so I would never think of removing it from the pack. From the text above you have already realized that this is a top-loading pack, but you have also a large bottom compartment with an extra entry. Note that the divider between the main compartment and the bottom section is a real divider and by this I mean it is with zipper and it closes the space completely. So this is much better than what you have in many other (top class and expensive) packs that are on the market. You can open the space completely and use both sections as one large compartment. 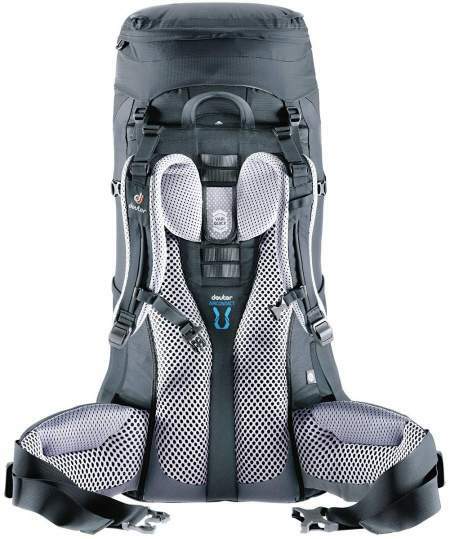 The pack is hydration compatible, so you have a hydration sleeve in the main compartment behind the harness. You can route the hose along either of the shoulder straps. The bottom compartment with numerous attachment elements around. As mentioned above, this is a women-specific design that incorporates ergonomic features suitable for a female body, with a conical hip belt and narrower and shorter shoulder straps. The buckles are also smaller and softer. This is a backpack for hikers, backpackers, mountaineers, and for travel. It is big enough for multi-day and week-long outdoor trips, and with lots of external attachment points, plus the mentioned expandable collar. Deuter rarely gives the maximum load capacity, but I have been using their backpacks in the past 15 years and I can say they are indestructible. Here you have what they call the Aircontact Vari Quick adjustable suspension system. This is a ladder type system which you can see in the picture below, so you can put the harness on a number of discrete positions and fix in place with Velcro tabs. The adjustability is in the range 14 – 20 inches (36 – 51 cm). This is supported with an X-shaped aluminum frame which is behind the harness, so this is a very strong and rigid construction. Vari Quick adjustable suspension system. The padding on the hip belt is huge and you have dual density foam here covered with a very breathable mesh. This is an ergonomic Comfort Lock design for an optimal stability. A similar structure is on the shoulder harness which is without stitching on the side to the body to avoid hot spots. This is an anatomical S-shaped structure with very soft edges. The back padding is the same and here you have a vertical chimney in the center for ventilation. The pads on the sides provide a great support and cushion, and they are very breathable. Observe also the V-shaped front straps on both sides of the hip belt, this tensions the massive padding in an optimal way so that it hugs the body. I love such a design in packs. There are 7 of them in total, two on the lid, one external with a key clip and one underneath the lid. Two good sized zippered pockets are on the hip belt, and two large stretchy mesh pockets are on the sides. One large stretchy mesh pocket with a buckle is on the front. I miss to see side zippered pockets, but you have them in their another pack, the Futura Vario 50+10. On the top lid you have 4 loops for equipment attachment, here you can attach a solar panel or pad, etc. You also have loops on the front for helmet attachment. Similar attachment loops are also on the bottom plus ice axe and hiking pole attachment loops and those are paired with bungee tie-offs on the front to fix your poles in place. There are dual compression straps on the sides. Those lower, on the side pockets, are with the inside-out feature, this means you can pass them through the pocket to cinch the load in the main compartment, or over the pockets to secure the items in the pockets. There are dual compression straps over the bottom compartment, those are only on the two largest packs in this series. The hip belt is equipped with side straps to stabilize the load by shifting the pack towards the body. You have load lifters straps on the top of the harness. The adjustable sternum strap is at the usual place, it is the rail type and you also have an emergency whistle there. Over the collar, there is a compression strap, so here you can fix the rope or any piece of clothing. Expandable collar for 10 liters extra. Removable lid doubles as a daypack. Very good and adjustable suspension. Best use: hiking, backpacking, mountaineering, travel. Weight: 1.9 kg (4 lb 3 oz). Volume: 60 + 10 l (3661 + 610 in³). Dimensions: 32.3 x 11.8 x 9.5 in (82 x 30 x 24 cm). Torso fit: 14 – 20 in (36 – 51 cm). In the table below I give this Aircontact Lite pack side by side with two other packs for women, top brands as you realize. As usual, It is hard to match Kelty when it is about the price, so you might want to follow the links to read more. *This is dependent on the market, in EU it comes with a rain cover. 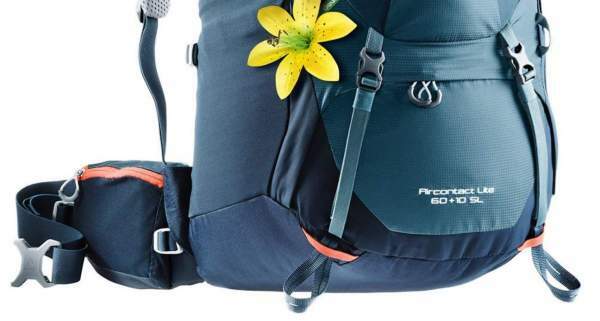 So in the summary of this Deuter Aircontact Lite 60+10 SL Backpack For Women review, I would stress that they have built a nice pack with the weight that is in between the two of their popular series ACT Lite and Aircontact. The pack lacks some features which you can find in the Futura Vario series, like the rain cover and the side zippered pockets, and the suspension system which you have here is completely different. All in all, this is yet another great product from Deuter, a reliable pack built to last. I have included this pack in my list of the best women’s backpacking packs. If you need to see some more options from this size range, please check my page with packs above 55 liters. All top models from renown brands are presented there. You might want to compare this pack with the brand new item from Osprey, the Osprey Renn 65 Backpack for Women. Thank you for reading and have a nice day.